The Jane Byrne Interchange connects Congress Parkway, Kennedy (I-90), Eisenhower (I-290) and Dan Ryan (I-90/94) expressways in Chicago. CHICAGO (WLS) -- This is the final weekend of lane closings for construction on the Jane Byrne Interchange. Lanes on the outbound Eisenhower at the Interchange and inbound Kennedy between Ohio and Harrison streets are closed. Crews are installing the final steel beams for the deck of the new flyover bridge. 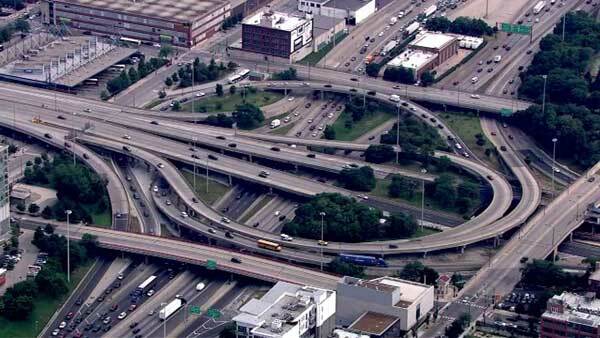 Once completed, it will link the inbound Dan Ryan to the outbound Eisenhower. All lanes will re-open by the Monday morning rush.